Improving resource productivity and ensuring a sustainable resource and materials management building on the principle of the 3Rs (reduce, reuse, recycle) is a central element of green growth policies. It helps to improve the environment, by reducing the amount of resources that the economy requires and diminishing the associated environmental impacts, and sustain economic growth by securing adequate supplies of materials and improving competitiveness. To be successful such policies need to be founded on a good understanding of how minerals, metals, timber or other materials flow through the economy throughout their life cycle, and of how this affects the productivity of the economy and the quality of the environment. This report contributes to this understanding. It describes the material basis of OECD economies and provides a factual analysis of material flows and resource productivity in OECD countries in a global context. It considers the production and consumption of materials, as well as their international flows and available stocks, and the environmental implications associated with their use. It also describes some of the challenges and opportunities associated with selected materials and products that are internationally-significant, both in economic and environmental terms (aluminium, copper, iron and steel, paper, phosphate rock and rare earth elements). Natural resources provide essential raw materials and other commodities, and are an important source of income and jobs. They also support the provision of ecosystem services necessary to develop human and social capital. The way natural resources and materials are managed and used is important, not only from an environmental perspective but also from an economic perspective. Improving resource productivity is thus central to achieving green growth and has become a priority for governments and businesses alike. Resource productivity contains both a quantitative dimension (producing more with a given amount of natural resources), and a qualitative dimension (reducing the environmental impacts of natural resource use). 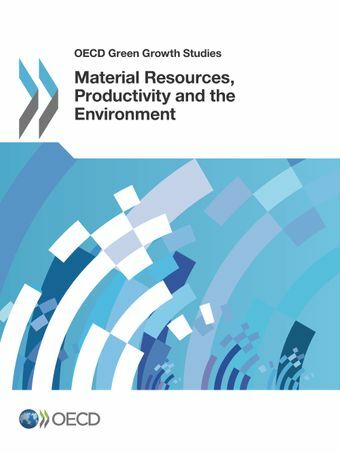 The OECD report Material Resources, Productivity and the Environment examines how material resources flow between the economy and the environment, and the factors that drive changes in resource productivity over time and across countries. The report uses concepts and tools from material flow analysis and accounting, and provides a factual basis to help understand some of the key challenges and opportunities associated with material resources and resource productivity in OECD countries. The amount of materials extracted worldwide doubled since 1980, reaching close to 72 Gt in 2010, and is projected to reach 100 Gt by 2030. Materials consumption is driven primarily by construction materials (36% of OECD materials consumption in weight), fossil fuel energy carriers (28%), and biomass for food and feed (20%). In recent years, there have been signs of decoupling between GDP growth and the growth in materials extraction and use: OECD uses 45% less material for every unit of economic output. This decoupling is particularly noticeable in countries in which efforts in waste management and recycling have been instrumental in improving overall resource productivity. Despite these relatively positive signs, environmental pressures and risks of resource scarcity will continue to intensify as greater demands are placed on the environment with, notably, the quadrupling of the population by 2050. Governments should scale up existing policies in order to further decouple the use of material resources from economic growth. Possible measure to consider are: promoting integrated life-cycle-orientated approaches, introducing fees for the use of resources, charges for environmental damage, or supporting longer product lifespans such as through increased legal minimum warranty periods. The private sector could identify new business models linked to improved resource efficiency of production processes and realise that “less material” can mean “more value”. Consumers need to be more aware of the role that every one of us can play and contribute through better product choices and behaviour. To assist various stakeholders in their efforts, the OECD has published a report on Sustainable Materials Management: Making Better of Use of Resources and organised a Global Forum on Promoting Sustainable Material Management through Extended Producer Responsibility (EPR) in 2014.